I love beets. Really, I love them, even crave them, the way that some people crave chocolate or donuts. If there was a time in my early years when I didn’t love them, perhaps choosing instead to hide them in a napkin or offer them to our dog, those memories have since been overwritten with nothing but beet love. Roasted. The first time I prepared beets in my own kitchen they were roasted. It remains my go-to method for cooking them, not just because it’s foolproof and easy—wash, wrap in foil, roast at 400°F ‘til tender, peel, and smile—but because high roasting temperatures coax out the natural sweetness of the beets. My favorite beets, however, aren’t roasted, they’re pickled by my sister Annie. The beets we were raised on were also pickled, never roasted. In our house veggies were only boiled or fried into submission. Mom’s beets were slightly sweet, gently spiced, perfectly tart—a flavor profile I couldn’t get enough of then or now. On pickling day, a highly anticipated annual event in my childhood kitchen, the vapors floating out of the simmering vat of vinegar and beet juice were so pungent they brought tears to my eyes. But I didn’t mind. Mom made me keep my distance as she filled the waiting quart-sized Mason jars with chunks of boiled beets and the scalding, inky brine. Her worn, masculine hands were stained a vibrant magenta from peeling and chopping the beets, their juice collecting and concentrating in the deepest cracks. One particularly eventful pickling Saturday those stained hands dumped a cooled pot of leftover beet juice over the back porch railing and onto the neighbor’s blonde, wiry haired yipper dog. Sandy was fond of doing his business in our yard and peeing on our clothes baskets while the clothes dried on the line. No longer so aptly named, Sandy left our yard in a hurry wearing his new purple coat and howling the whole way home. No amount of shampooing could restore Sandy’s coat. It faded gradually over the next few weeks like the 28-day, semi-permanent hair color that I’m too familiar with these days. Sandy stopped peeing on the baskets or coming into our yard at all, and his owners stopped speaking to any of us. Mom believed it was a price worth paying. When Greg and I moved into our home in 1999 and immediately dug and planted our first garden, beets were the first seeds we planted. An entire pack of tiny black seeds were sown in two tidy rows. I could hardly wait to harvest them and fill my own home with the scent of sweet, spicy vinegar. By then pickling had become a family pastime practiced only by Annie and mom was losing her battle to cancer. Instead of pickled beets I got a painful lesson in soil science. Our beets, all four of them that survived that summer, clawing their way into the hard clay that dominated our soil, were no bigger than unshelled pecans. Over the years our soil and our beet harvest has improved, though we never had a harvest large enough to warrant the necessary labors that canning and preserving require. 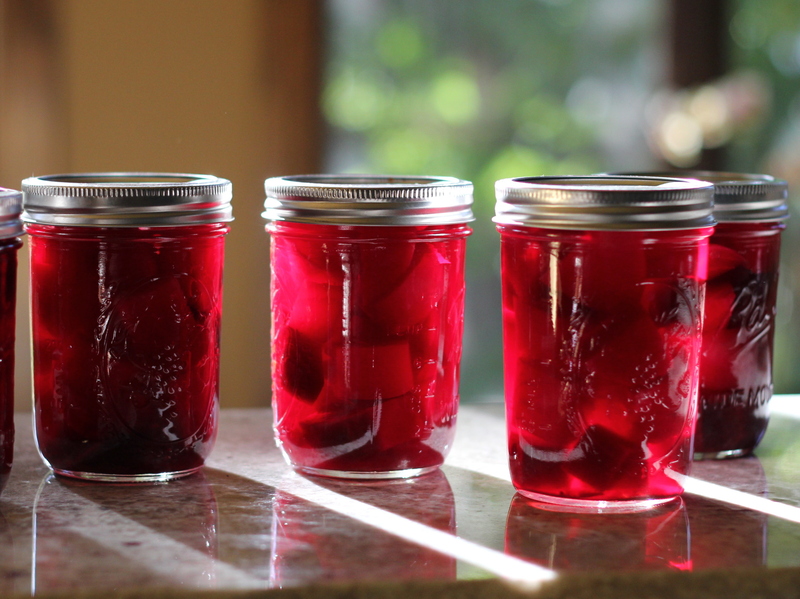 Fortunately Annie graciously shares a quart or two of her pickled beets with us each Christmas when we visit. And her beets are even better than mom’s. Then came beet harvest 2013. Beets, beets, and more beets. 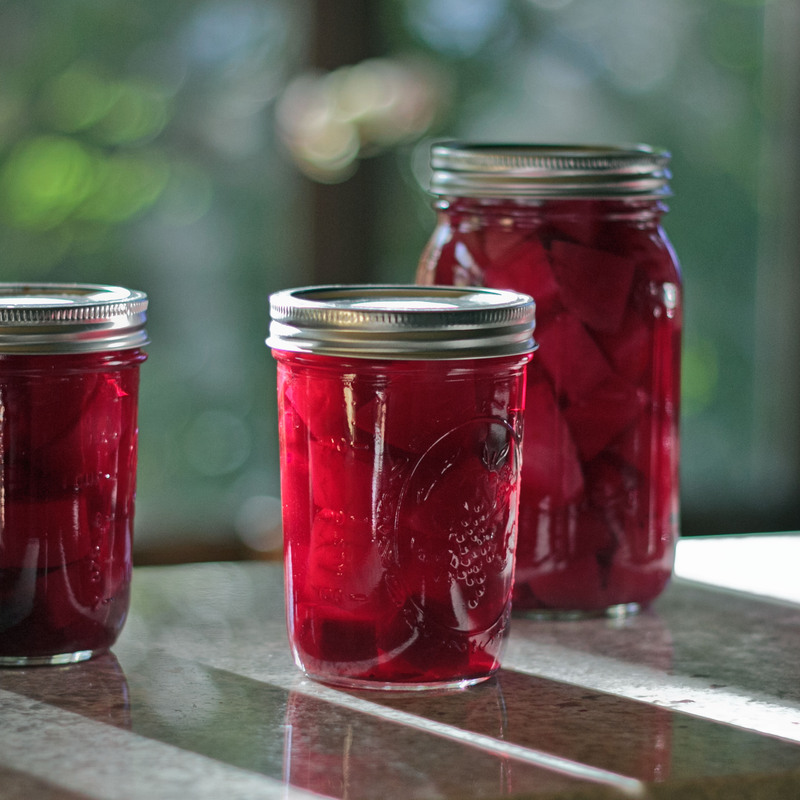 At long last, it was time to pickle our very own beets. “Call me. Need to talk about pickled beets,” I texted to Annie when I hit a road block in her recipe: pickling spice. “Hey, I need your recipe for pickling spice,” I said when my beet mentor rang a few minutes later. “I don’t have a recipe,” she replied. What??!! This was a surprising setback, because Annie is a “make-it, don’t buy it” kind of kitchen operator. She went on to describe the spice she buys and where she buys it, information that was of little use to me when my beets were burbling on the stove and darned near “fork tender” and ready for peeling. The remainder of her tips proved useful and timely. Unfortunately, I was still left with the matter of concocting a pickle spice. And so began a mad internet recipe search. Every pickle spice recipe was different, yet common themes emerged: allspice, peppercorns, coriander seeds, and bay leaves. I ravaged my spice cabinet and got to work on my own mix, tweaking the recipe mashup as I went. No dill, a little more star anise. How could I know how much, if any, of those spices were in my favorite pickled beets? I seldom fear kitchen failure, considering each an opportunity to learn, but the thought of this long-awaited, beautiful bounty going to waste was more than I could stomach. My beets aren’t Annie’s beets, just as Annie’s aren’t my mom’s. But they are some damn fine pickled beets, so fine I didn’t mind the hour it took me to clean up the sticky purple blotches that peppered the kitchen counters and floor. I poured the extra beet juice down the drain without a thought. A few minutes later Morris the Cat’s twin came strolling through our yard again. The collarless, blonde stray has converted the mulch pile under my favorite backyard bench into a litter box. If next year’s harvest provides us with enough beets to pickle, you can bet I’m going to hold on to that inky juice. Place beets in a large stockpot with enough water to cover. Bring to a boil, and cook until fork tender, about 20-60 minutes depending on the size of the beets. If beets vary significantly in size, put the biggest ones in first and simmer for a bit, then add the smaller ones. Drain, reserving 4 cups of the beet water. Cool, peel, and slice the beets into chunks if large. Secure the Pickling Spice in cheesecloth. Combine the spice bundle, sugar, vinegar, and beet water in a soup pot over medium heat. Stir until the sugar dissolves and bring to a boil. Reduce heat and simmer for 30 minutes. Remove the spice bag. Add the sliced beets and bring to a boil again then remove from heat. While the pickling liquid simmers, sterilize jars and lids by immersing in boiling water for at least 10 minutes. Miss you!! Loves this one. Can’t wait to see the purple cat next year. You will have to include a photo. After looking over a number of the blog posts on your web site, I seriously like your technique of blogging.